A double helping of little miracles. One of whom wants DOWN. I mentioned on Monday that my brother and his family spent last weekend with us. That would be a total of four adults, one teenager, and two toddlers under the age of three. Let me say, five big people to two little people is not an unreasonable ratio. I think they could take us if they tried. Oh, and one dog who was mostly on the little people end of things. I LOVED spending time with my family. They live in WV so extended visits are less frequent than I would like. But as much as I enjoyed the visit, I do have a bit more perspective than I did last week. I have a demanding, sometimes stressful job. I fit my writing in on evenings and weekends. Sometimes I get frustrated because life gets in the way and I fall behind on my self-imposed writing schedule. I might have even envied some of the writer-moms I know who are, after all, staying at home where they don’t have to deal with supervisors, clients, co-workers, staff, donors, overtime, weekend work, etc. the way I do. I just have one thing to say. I take it back. One weekend with two toddlers and I was flat out. I’ve now been through multiple meals, bath times, bedtimes, shopping, visiting the Nature Center, playing in the yard, dancing, nap time, time to get dressed, and so on. It’s non-stop and it’s exhausting. Honestly, it doesn’t seem like hot dogs, chicken nuggets, bananas, and juice could fuel that kind of energy. They must be sneaking those little energy shots when we’re not looking. Except we’re always looking because if we look away one of them is on top of the refrigerator and the other is pulling everything out of the kitchen cabinets. This past weekend was wonderful and I look forward to doing it again–eventually. In the meantime, though, I want moms (and dads!) everywhere to know you have my deepest admiration. All of you who are raising children? You are amazing. As for all of you who are raising children while holding down a job, writing books, cleaning your house, helping at church, and doing all the other things you do? You are nothing short of a miracle. Thank you, Sarah! It was actually a writer-mom who inspired me to start writing books (Stephenie Meyer–don’t laugh! Grin). I have highest admiration for writer-moms. And I appreciate that you do, too! I guess Stephanie can afford a nanny now, huh? Sarah–I read in a magazine that her hubby now does 100% of the house-duties…so that was interesting. I have it easier than some of these writer-moms who home-school, or who have little ones. THOSE moms need a six month vacation, twice a year!!! Oh yes, the home-schoolers. Miracle workers, indeed! Ooo! Can I cash in on that six month vacation? Even six hours? I agree, Sarah. It boggles my mind how moms with little ones manage to write at all. I know how exhausting writing its. I’ve seen how exhausting child rearing is. How can one person do both? Yet they do. Super heroes, in my book. I was thinking of her too!! I don’t think she sleeps. Thanks for the shout-out to stay-at-home moms! I think both jobs are hard — staying at home with children and writing, and having a full-time professional job (as in paid!) and fitting in writing. I don’t know how you have time to write!! Proof that we can’t help but write–right? I wrote my first novel with three kids under the age of 3. 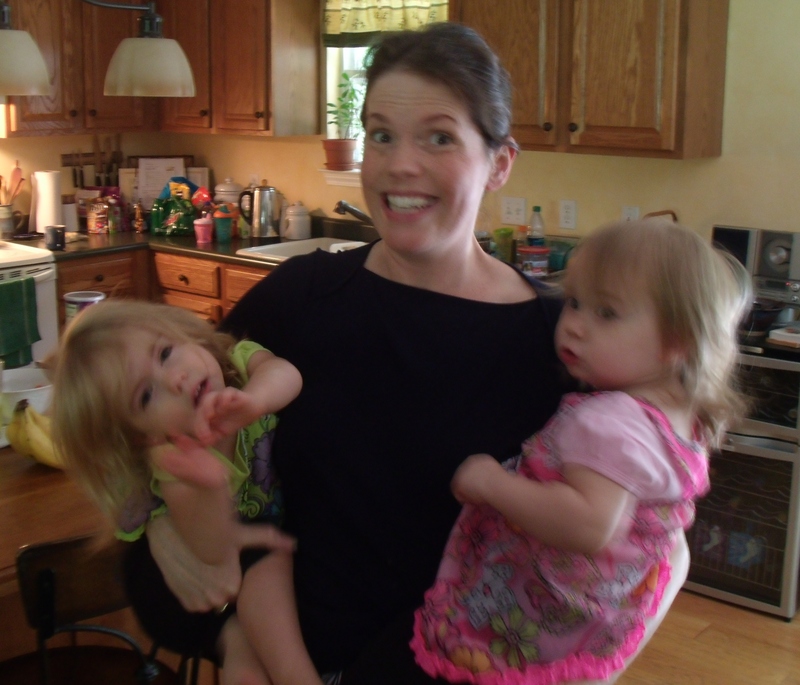 Three kids who didn’t take naps or enjoy sleeping at night (and my husband worked evenings back then). Thank you so much for this blog post. Now I need to go get some coffee. LOVE the picture and your expression! While I didn’t “write” when you all were small, I did garden, can, churn, help “hay,” mow the yard, mow the church, bake and cook for dinners and neighbors, in addition to the cleaning, laundry, reading and all the other important things of child care… and I LOVED every minute of it… well, 99% of the time! No human kids here…but do multitudes of rescued dogs (one in a wheelchair) count? I try to balance taking care of the house, the dogs, a terminal illness, and freelance welding…along with the Writing. Usually I write from 2000 to about 0300. Barbara does the 8 to 5, and I get her to the train station at 0630. It does get busy. But I could not imagine anything else, and I think that the intensity of life makes me a better writer. I compose and develop characters while taking care of the canids, and while welding, and so I pretty well know what I want to write when I can. As a result I rarely have problems with writer’s block. Almost never, actually. Yup, I often work out story plans whilst mowing grass or walking the dog. No welding for me, though! Man, a job, writing, AND kids. You ARE wonder woman. Loved this, Sarah, and I too loved the picture. And, if/when it’s your turn to wear the Mommy Hat, you’ll figure out where writing fits into your day. This summer has shown me how purposeful I must be in carving time out of a day to write. Kids home on summer break=not much time. 🙂 I LOVED your post! I had to come find this post after you told me about it at The Cove. Love your perspective! I COMPLETELY underestimated how much work a little would take. Completely buy your theory about sneaking energy shots! For me, the hardest part is the unpredictability. You never know what’s coming next. Thanks for coming and finding my post! It was great meeting you and I am SO impressed that you’re a writer AND a mom. Especially to a 10-month-old!